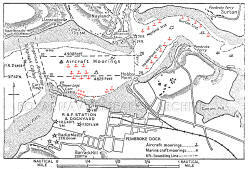 ACQUISITION Lodger facilities for an RN Air Section and a single Seaplane squadron from R.A.F. Coastal Command. Air traffic control 24 hours service by R.A.F. personnel. 15/33 QDM. ---° ----° .... --- x -- yds. 07/26 QDM. ---° ----° .... --- x -- yds. 10/28 QDM. ---° ----° .... --- x -- yds. 20/02 QDM. ---° ----° .... --- x -- yds. Three W/T masts (200') on St Patrick's hill, S. of dock barrack hill, 5 miles. Hills (350') N., N.E., and N.W. within 5 miles. Hill range N.E. (673') within 10 miles. Hill range N.N.E. (1760') within 20 miles. By night: Fixed flare path buoys, show pilot lights when not in use. Obstruction lights around Haven. Lead-in funnels on all flare paths except No,2. at Neyland, served by a single slipway. MOORINGS Limited moorings adjacent to the landing area, multiple moorings in the River Cleddau, opposite and up river from, R.A.F. Station. Beaching area in Angle Bay. SLIPWAYS 3, two at R.A.F. Station (1,121' and 199'), the third at remote dispersal on opposite bank of River Cleddau. METEOROLOGICAL 24 hours service by R.A.F. personnel. WORKSHOPS Equipped to service all Flying Boats and Seaplanes. Moved here from RNAS Lee0on-Solent 03.07.1940. Moved to RNAS Lawrenny Ferry 04.10.1941. 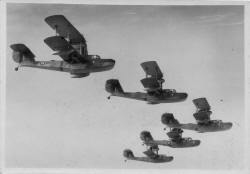 Equipped Walrus amphibians and Swordfish floatplanes. The Royal Air Force arrived in Pembroke Dock on 1 January 1930 and developed facilities for Seaplane servicing using a floating dock to lift individual aircraft for maintenance. It was developed further in 1938 when two 'B' and one 'T' hangars were built together with two large slipways to enable aircraft to taxi or be winched ashore for servicing. At its operational peak during the Second World War it was host to 99 aircraft. 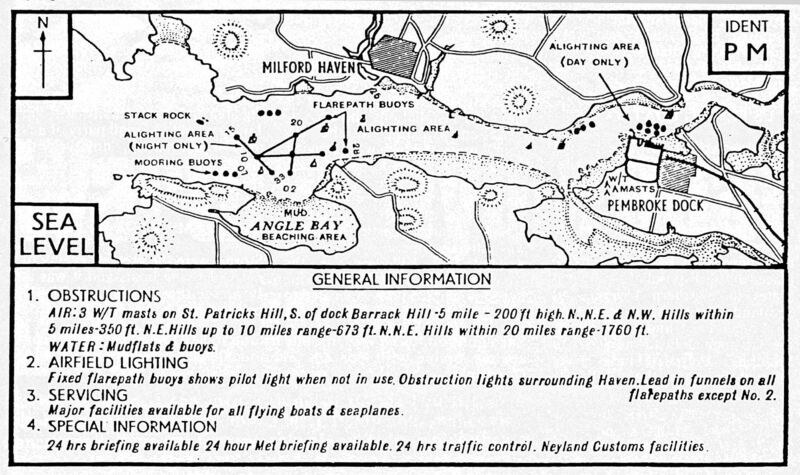 Located on the south bank of the River Cleddau 5 miles upriver from Milford Haven the station operated a Seaplane landing, mooring and beaching area at Angle Bay 5½ miles down river; after water taxiing up river aircraft could be moored mid channel opposite the RAF Station and along the banks up river. BThe Royal Navy was granted lodger facilities for an RN Air Section and a single Seaplane squadron in 1940 and No. 764 squadron arrived from RNAS Lee-on-Solent on July 3rd. The squadron had had formed at Lee-on-Solent as an Advanced Seaplane Conversion Squadron operating a mix of Walrus amphibians, Seafox and Swordfish floatplanes, trainees embarking in the Seaplane Carrier HMS PEGASUS for catapult training. Most of the Seafoxes were left behind when the squadron moved to Pembroke Dock. No. 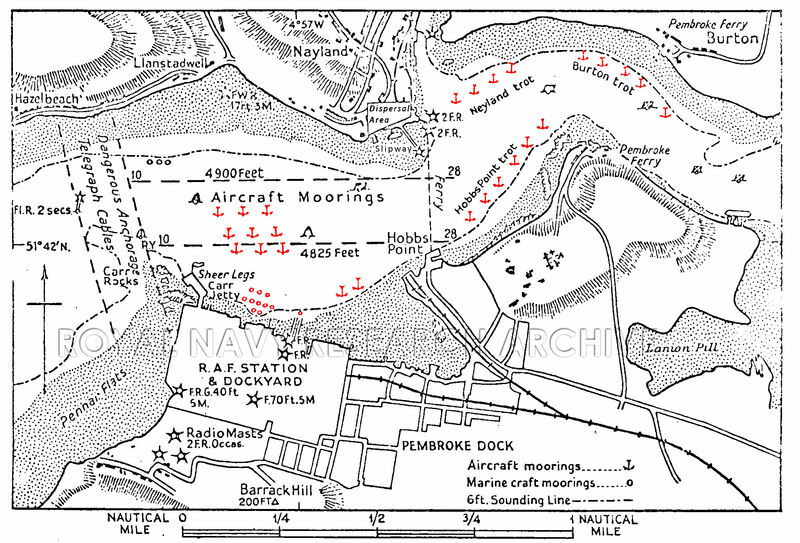 764 squadron began operating from another site, up river at Lawrenny Ferry, from May 1941 but in October 1941 the Air Section was withdrawn in response to enemy air raids on Pembroke Docks and relocated to the Lawrenny Ferry site. 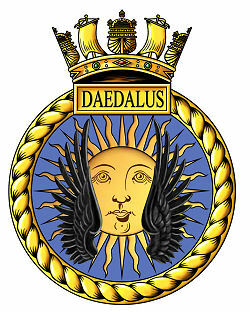 This became a Royal Naval Air Station under the control of HMS DAEDALUS at Lee-on-Solent on February 1st 1942 and. 764 transferred to its control.